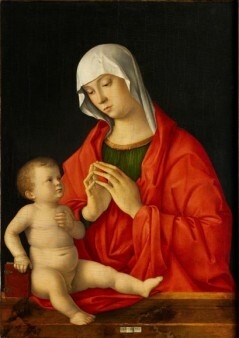 Giovanni Bellini (1438/1440-1516), Virgin and Child (1480-1485). Abou Dhabi, Louvre Abou Dhabi. The Louvre Abu Dhabi is unveiling the best of its new collection for the first time in France. One hundred and fifty of the finest masterpieces already acquired by the UAE museum will be presented in Paris, during a major exhibition entitled Birth of a Museum, opening on May 2, 2014, at the Napoleon Hall (under the Pyramid). Among these exceptional works there is a gold bracelet with figures of lions made in Iran nearly 3,000 years ago; a fibula (brooch) in gold with garnets from Italy dating from the fifth century AD; paintings by Jordaens, Manet, and Magritte; a previously unseen papier collé by Picasso; and nine paintings by the recently deceased American painter Cy Twombly. The Louvre Abu Dhabi, which will be opening in December 2015, will be the first universal museum created in the Middle East, a region at the crossroads of civilizations. Its collection of old and contemporary works from different countries is being built up gradually. The exhibition will enable the French public to get a preview of the cultural wealth of the collection of the future museum and also to grasp the architectural and cultural project. The exhibition will run through July 28, 2014. Organized by: Vincent Pomarède, Musée du Louvre, associated with Laurence des Cars, Musée de l’Orangerie.